Designed with every bowling style in mind. Designed with every lane pattern type in mind. Pin/top weight requests cannot be made for x-out bowling balls. The Track Alias high performance bowling ball was designed with all bowling styles and all lane patterns considered. This ball can be drilled for any circumstance you might find yourself facing. This ball can be transformed for a smooth, strong mid lane delivery or an angular motion. This is all achieved due to the versatile Alias core that is being introduced with this ball. Track designed this core to have an extremely tight pin distance and top weight spec. This will allow the driller to accomplish multiple mass bias drilling angles without the need of a weight hole. This also creates an intermediate differential range of perfectly symmetric .000 Intermediate Differential to a very asymmetric, high Intermediate Differential. This unique core is covered with a Prime Hybrid coverstock and is finished with a 500/2000 sanding. This cover responds quickly to friction on those heavier oiled lane conditions and provides a lot of hook. Similar Balls: Same Hook Potential, Lane Conditions & Coverstock as the Track Alias X-OUT. 4 of 4 customers found this answer helpful. Did you? Yes | No Did you find this answer helpful? Yes | No Thanks for your feedback! If your new ball cracks when it's drilled by a pro shop, bowling.com will replace your ball free of charge! Manufacturers' warranties typically do not cover for cracking during drilling and drillers are not held responsible for their mistakes or defects in the ball. Looking for a 2 to 3 inch pin and weight in the mid 14lbs. Does the Alias core come in 13 pound balls? The Alias core is only available in 14-16lbs. When desiring to order an x-out, can I ask for a blemish only ? You can request for this information in the special comments box on the last page of the order page. Yes, this ball best performs on heavy oil conditions only. How do I drill this ball to hook early? Unfortunately, the warehouse will only let us know if the irregularity is the overall weight. They do not notify us about other specs. can I get a 10 pounder? Unfortunately, only 16# is available for this is a closeout item and we will not be getting anymore weights in stock. 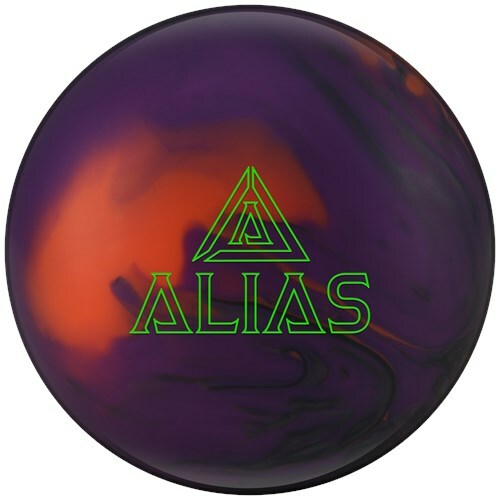 Due to the time it takes to produce the Track Alias X-OUT ball it will ship in immediately. We cannot ship this ball outside the United States.